Lower carb French toast with a tortilla as the base for this amazing breakfast. A sweet and savory taste explosion! 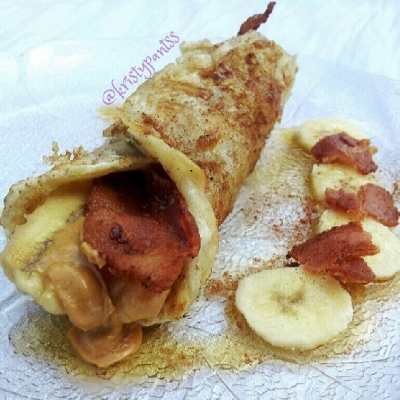 For the wrap, I dipped a small tortilla in a mixture of 2 egg whites, a tsp of vanilla, cinnamon, and nutmeg. Cook evenly on both sides. Once plated, spread about a tablespoon of @peanutbutterco Mighty Maple pb down the middle of the wrap. Do this while its hot so it gets all melty yummm. I quickly grilled a small banana (sliced in half lengthwise) and put it on top of the pb along with a slice of bacon that I cooked first. Fold, dust with extra cinnamon, and drizzle with maple syrup.